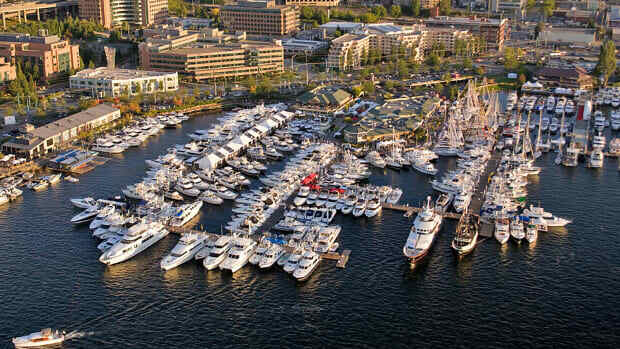 In-Water Boat Show: Thursday, April 25, 3 10 a.m. - 5 p.m. Friday, April 26, 10 a.m. - 5 p.m. Saturday, April 27, 10 a.m. - 4 p.m. 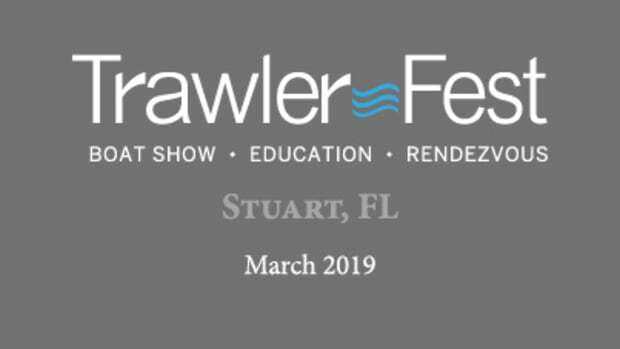 If you wish to become an exhibitor and display your boat for sale at TrawlerFest, please contact Ryan Davidson at (954) 328-7573 or rdavidson@aimmedia.com. 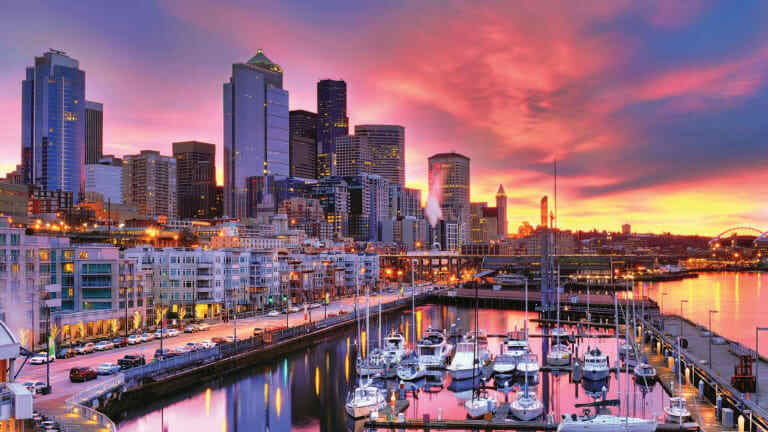 All seminars will be held onsite at the Seattle Marriott Waterfront. Seminar registration will be at the hotel. 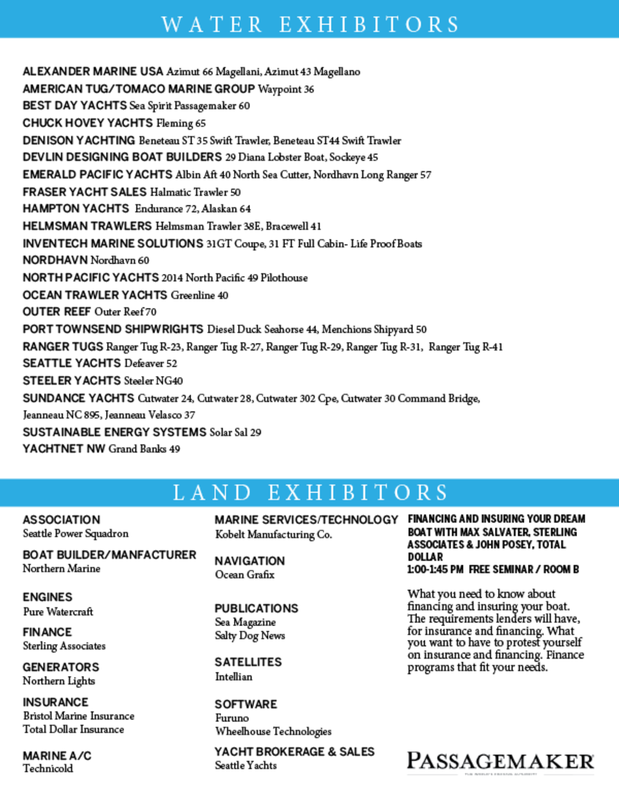 General admission is included for the day of the boat show with all seminar purchases. If you are attending a seminar on Tuesday or Wednesday, please reference that seminar and bring your name badge for general admission to the show. Tuesday, April 23 & Wednesday, April 24, 8:30 a.m. – 5 p.m. This is not the only diesel engine course for boaters, but it is the only diesel engine course for boaters taught by author/researcher Nigel Calder and veteran marine trades educator Mike Beemer. It is also worthy of note that unlike most other engine instructors Calder, PassageMaker magazine’s technical editor, is also a real-deal world cruiser, who bring this perspective to the curriculum. Beemer is department chair for the Marine Maintenance Technology school at Skagit Valley College in Anacortes. LUNCH: Attendees will be provided box lunches both days. PARTY/CEREMONY: Attendees and spouses are welcome to a “graduation” party after Wednesday’s session, during which certificates of completion will be awarded, and a good time will be had. In some cases, the certificate of completion may help attendees save money on their boat insurance. The certificate of completion awarded to attendees may help save some money on their boat insurance. Packing, Provisioning and Preparing Your Boat for the Inside Passage to Alaska. Before you embark on an extended cruise in the Pacific Northwest or up the Inside Passage to Southeast Alaska, you might want some tips about what to pack, and how to prepare your boat (and yourself) for the adventure. The Slowboat team shares lessons from numerous trips and leading flotillas up the Inside Passage from Washington through British Columbia up to Southeast Alaska. They’ll discuss food, clothing, first aid, spares, ground tackle, boat systems, general best practices, and how and where to get parts and supplies along the way. The seminar is a distillation of lessons learned by the SlowBoat trio from having guided several cruising boat flotillas to British Columbia and Alaska. About Slowboat: Sam, Laura, and Kevin are the team behind Slowboat.com. 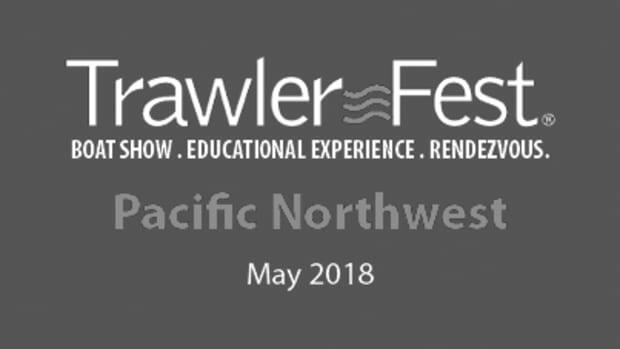 Their goal is to demystify cruising in the Pacific Northwest and to empower and enable cruisers to explore further with safety, comfort, and confidence. They have made numerous trips up and down the Inside Passage to and from SE Alaska, both individually and leading flotillas. Sam is former managing editor of the Waggoner Cruising Guide, and lives aboard his 37’ Nordic Tug Safe Harbour. Laura is a professional photographer and writer and is usually at the helm of Airship, a 34’ Nordic Tug. Kevin is an entrepreneur, engineer, writer, pilot, and deck-hand, and travels with Laura aboard Airship. How do I get home when my GPS fails? Robert Reeder, who teaches coastal piloting and terrestrial navigation, will discuss how to get home when the ship’s GPS fails, using an integrated approach that includes simple and inexpensive tools, paper charts, electronic charts and radar. A veteran of the U.S. Navy, Reeder continued his career on tankers, container ships, tugboats and other commercial craft. He has a 1,600-ton master’s license and presently works on Seattle-area passenger ferries. For fun he sails a 25-foot sloop. How often do you need to “commute” (fly home & back)? How much time do you have (9 to 22 months)? Pat Rains, a veteran delivery captain & author of “Mexico Boating Guide,” plots 3 itineraries that hit the best destinations at just the right seasons; mix of resort marinas & pristine coves; reliable fuel docks & air connections; where to summer over yet avoid hurricanes. Pacific Baja, Los Cabos, La Paz, Puerto Escondido, Sea of Cortez, Mazatlan, Puerto Vallarta, Gold Coast, Barra de Navidad, Manzanillo, Zihuatanejo, Acapulco, Marina Chiapas. Plus: What’s New in Mexico Cruising? 2019 international check-in procedures & tourist cards; CUBAR 2019 update; improvements at Cedros Island & Turtle Bay; guided excursions at Magdalena Bay; expansion at Marina Puerto Escondido in the Sea of Cortez. Hand Outs: (1.) Directory of all the marinas on Mexico’s West Coast. (2.) Paperwork Cha Cha 2019 links to DIY on-line port clearance. 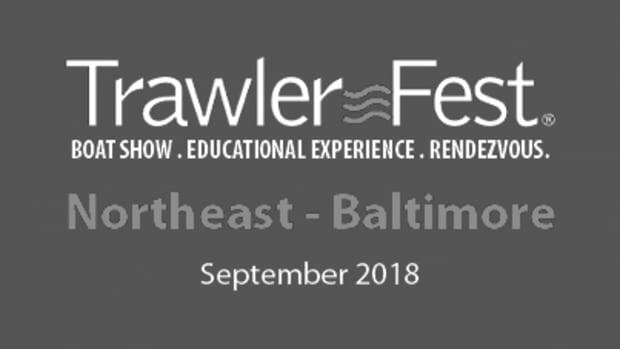 This course, combined with an on-the-water session will develop skills in close quarters maneuvering and docking, not to mention the confidence gained from having been taught by an experienced marine trainer and TrawlerFest veteran. As an Emeritus Associate Professor from the University of Washington, Lewis brings her professional educator background and 40 years of hands-on boating experience to her skills-focused teaching. She has taught hundreds of individuals and couples on their power boats over the last 15 years. The certificate of completion awarded to attendees may help save some money on their boat insurance. When Joshua Slocum sailed Spray around the world, one thing he really missed was a fresh water bath. Many modern vessels are equipped with water-makers, and there are many great options available. This course will take you through the theory of water-making, options that are available, why they are so expensive, and maintenance of these systems. We will also discuss options and resources for the DIY boat owner wanting to save some money by building their own system. Beemer knows of what he speaks. He is department chair for the Marine Maintenance Technology school at Skagit Valley College in Anacortes. Based on how much time you have (seven months or 14 months), and how slowly you like to cruise, and how often you need to fly home (commute), veteran delivery captain and cruising guide author Pat Rains explains two route plans that hit the best destinations at the right seasons and avoid hurricane alley. Yet you get interesting coastal cruising, stops at good marinas with fuel & air connections. Both itineraries transit the Panama Canal. (1.) Pacific side: Start in November from Mexico’s Barra Navidad, scoot by Tehuantepec, exit at Marina Chiapas to El Salvador’s marina estuaries, scoot by Papagallo, linger along Costa Rica’s three cruising grounds, reach Panama by June 1. (2.) Caribbean side: Start in December from Florida; Mexico’s Yucatan Channel cruising grounds; Belize Reefs; summer over in Guatemala’s lush Rio Dulce; December 1 head out to Providencia & San Andres; cut over to Bocas del Toro or San Blas Islands. Plus, What’s New Along Pacific CentAm and Panama Canal. The Panama Posse and the El Salvador Cruisers Rally; Costa Rica’s and Panama’s new time limits and immigration changes. How does the Panama Canal’s new Third Lane affect yachts in transit? Want to cruise further, but deterred by one of the gates? This presentation is about the gates collectively and individually: the Strait of Georgia, the rapids north of Desolation Sound, Johnstone Strait, Cape Caution, and Dixon Entrance. We’ll cover why you might want to cross each gate, tips for making a safe and enjoyable trip, and answer questions you might have. We’ll practice using real-time weather information to fill out Slowboat Weather Worksheets to help participants build a complete picture of the conditions at each of the gates. We’ll practice calculating times of slack at the major rapids along the Inside Passage and how to time your transit perfectly. The Slowboat goal is to demystify cruising in the Pacific Northwest and to empower and enable cruisers to explore further with safety, comfort, and confidence. They have made numerous trips up and down the Inside Passage to and from Southeast Alaska, both individually and leading flotillas. Veteran marine trainer Linda Lewis shows attendees how to put into practice what they learned in Boat Handling Theory, a prerequisite for the class. Even when it goes well, buying a boat can be a stressful process. The idea behind this eight-hour seminar is to arm buyers with the information they need to minimize frustration and unnecessary expense. Five “team teach” instructors look at the challenges of boat buying from unique perspectives. This seminar has saved untold thousands of dollars for participants who avoided making costly mistakes over the past five years. The theme of the first morning is “physics & psychology,” leading off with the first decision a prospective buyer of a cruising boat must make. That is, what kind of cruiser you plan to be and therefore what kind of hull design. Enter an experienced boatbuilder to explain fiberglass boat construction and how to discern between good and bad. The theme on day two is “the fine print,” and it begins a leading surveyor as well as a builder, on how to choose the right surveyor and his or her proper role. Our yacht broker speaks on the topic of choosing a yacht broker and the elements of a good sales contract and an insurance veteran follows with a behind-the-scenes look at marine insurance and the elements of a good cruising policy. Each morning ends with that day’s panelists answering audience questions, and, as has sometimes happened in the past, engaging in friendly debate. Daunted by differing opinions from old salts at the marina? Intimidated by the jargon? Scared of storms and boat-eating rapids and dragging anchor in the middle of the night? This seminar is for you! We’ll help you understand the basics needed for successfully cruising in the Pacific Northwest. We’ll break down the various cruising areas and introduce you to the gates that separate them. We’ll unravel the customs & border mysteries and share techniques for trip planning, navigating, and weather routing. We’ll examine ways to stay connected. We’ll even look at the basics of marine electrical and water systems and help you understand practical ways to monitor and conserve these resources. Most of all, we’ll encourage you to get out and cruise! Linda Lewis, Laura Domela and Pat Rains all have cruised widely but with distinctly different experiences. 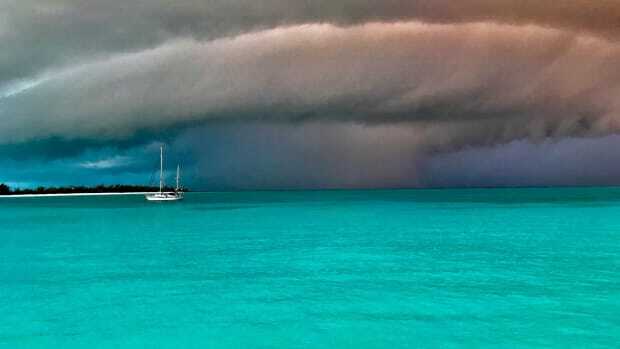 Rains, a captain, is a leading expert on cruising in Mexico. Laura Domela is part of a leads rallies up the Inside Passage to Alaska. Capt. Lewis has trained hundreds of people in boat handling. This seminar is for women who think they may want to go cruising or who have only recently entered into the cruising lifestyle and have a wide range of questions best answered by other women, and, alas, without any men in the room. What’s the basic 15-day cruise: fleet of 35 to 50 boats make 6 stops on Baja (Ensenada, Turtle Bay, Mag Bay, Los Cabos, Muertos, La Paz) for port clearance, refueling, rest, WX refuge, shore parties & excursions, with 3 overnight runs. Vessel & Crew requirements. Costs & Benefits: Discounts on slips, fuel, yacht services, skills classes, casual socializing, newbies learn from experienced Mexico cruisers, camaraderie underway, long-term friendships. This veteran delivery captain and cruising guide author will also discuss what worked and what didn’t as well as new developments for the 2019 CUBAR rally. Plus, Buddy Boating: Compatibility Considerations. Her discussion will include boats’ seakeeping abilities, duplicate electronics or shared, skipper and crew experience levels, budget levels, sense of adventure versus risk aversion. Lifestyle similarities: social drinking, physical fitness, shore excursions, bed time. Explore the West Coast of Vancouver Island with Slowboat! This seminar will cover why you might want to cruise the West Coast of Vancouver Island (and why you might not want to), the best destinations and times of year, and how to avoid getting beaten up! Landsman is former managing editor of the Waggoner Cruising Guide, and lives aboard his 37-foot Nordic Tug Safe Harbour. Domela is a professional photographer and writer and is usually at the helm of the Nordic Tug Airship, and Morris is an entrepreneur, engineer, writer, pilot and deck-hand, and travels with Laura aboard Airship. Veteran marine trainer Linda Lewis shows attendees how to put into practice what they learned in Boat Handling Illustrated, a prerequisite for the class. This seminar is designed to show you how to become proficient at electronic navigation—six working MFDs, 18 students with three per screen. Our instructor has spent an entire career developing marine electronics for Furuno. But this seminar is not about one brand; it’s about what all brands share in common, which is a lot. It’s an open secret that when one manufacturer introduces an innovative feature, that idea finds its way into the competition’s products pretty quickly, however different the interpretation may be. Certificate of completion. Electrical power is a confusing problem for most boaters. In addition to a jumble of technical terms and concepts, we end up having to learn a bunch of strange rules, like “never shower with the coffee maker on”, or “only run the microwave with the generator running” or “only dry your hair when plugged into shore power.” In this seminar, the Slowboat team will help you sort out the confusion of power systems for cruisers, and offer a new approach to boat power systems that could lead to hassle-free, almost unlimited electrical power onboard. In this “town hall” event, our panel of veteran cruisers will field audience questions on a wide-range of topics, sea stories always resulting. Circumnavigator Bruce Kessler can discuss what it’s like to spend months and months treading blue water. Surveyor Dylan Bailey is a veteran cruiser who learned to build boats with his father. Sam Devlin will discuss epoxy-wood boatbuilding for passagemaker boats. John Clayman is a prominent East Coast yacht broker, cruiser, racer and all-around boat guy. Eric Kunz, after a stint as a professional big-ship mariner, went on to help develop radars and other electronics for Furuno. Robert Reeder is a Navy vet and professional mariner who teaches seamanship and navigation. Kevin Morris and Sam Landsman are part of the Slowboat team that guides cruiser flotillas to Alaska. The moderator is Jeff Merrill, a certified professional yacht broker, author and trawler specialist with thousands of cruising miles with clients. 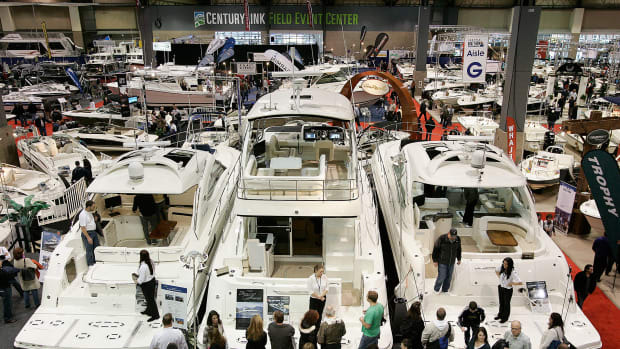 So, you want to buy a boat? Boatbuilder, cruiser and ace-surveyor Dylan Bailey explains what you should look for before making an offer and hiring a marine surveyor. A dream of the perfect cruising boat can be crushed when its surveyed, but some of those deal-killers could have been detected early were it not for the fact that buying a boat is rarely a rational decision; we are often lead by our hearts. Bailey explains the ways in which buyers can slow down and take a look at the boat with the rose-colored glasses off. He will cover how to inspect hoses, valves, wiring mistakes, and signs of structural damage. There will be many photos of examples of what to look for. Attendees will be given a check list to follow for their inspection. Learn the fundamentals of marine weather, with a special focus on Salish Sea weather patterns and weather routing. Robert Reeder explains how to find and use the best local weather resources from NOAA and Environment Canada, and correlate these with your onboard observations to confidently plan inland and coastal passage making. He will also summarize the various hardware and software forecasting solutions available on the market. Reeder began his seafaring career on U.S. Navy submarines, and has sailed commercially on tankers, container ships, tugboats, passenger boats, and just about anything that moves on the water. He lives with his wife and their daughters in “sunny” Seattle. First of all, we said “electronics” not “electrical.” This new seminar will prove that when marine electronics fail there are remedies available to a boater other than surrender and a telephone call to the technician. Eric Kunz, senior product manager for Furuno, takes a non-partisan look at how to troubleshoot hardware, systems and NMEA 0183 and 2000 networks using a meter and common sense. As a teaching aid Kunz will bring to class a networked system in miniature to play with. This is one of those seminars that can end up saving you more than the price of admission. 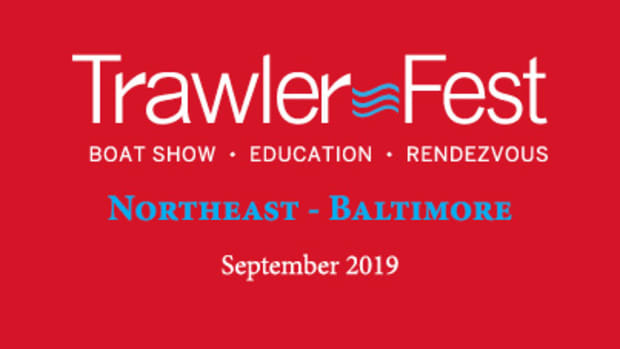 Every TrawlerFest includes at least one aspirational talk; one couple shares the story of making the transitition from dirt dwellers to capable cruisers. Rob and Deanna Piwowarczyk describe what it was like for them to "sell it all and move on a boat." The Piwowarczyks did just that, selling their house and business in the mountains of Colorado and moving aboard a Selene 55 in Southern California with two 90-pound dogs. They&apos;ll describe how they made the decision to "make the leap," how they searched for and chose their perfect boat, and what they&apos;ve learned along the way, including how to continue to earn a paycheck. And it all transpired more quickly than you might imagine. Rob will share estimated costs of ownership, what he&apos;s had to learn about diesel engines, water pumps, and all things marine mechanical. 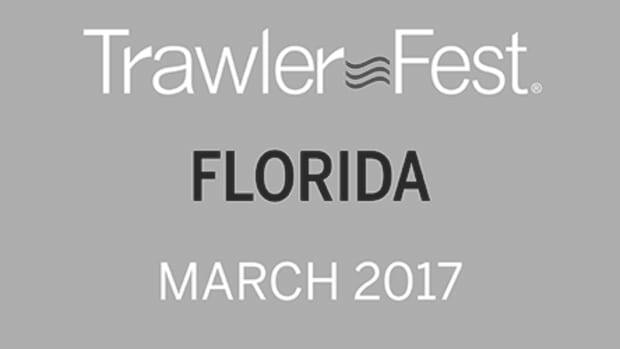 Deanna will discuss their long-term cruising plans and both will answer any questions for couples looking to become liveaboards. The Lifesling was developed for sailboats, but with some inventive rigging it is also extremely useful on power boats. The biggest challenges are finding a good location for the Lifesling and, most importantly, figuring out how to rig the 5:1 Block and Tackle connection-point that is high enough and strong enough. Capt. Linda Lewis teaches Lifesling recovery on power boats and has photos of multiple approaches to the rigging challenges power boaters face. The classroom portion of the course includes a video of a Lifesling recovery, a demo of the gear, and trouble-shooting ideas for YOUR boat. The second part of the course will be a dock-side, hands-on practice session working with the retrieval gear. Everyone will take a turn actually hauling someone who is seated on the dock up and into a boat. Can YOU get your partner into the boat? Lewis holds a USCG 100-Ton Masters License and provides customized on-the-water power boat instruction, on-your-boat She has 25 years of hands-on experience cruising the Inside Passage (including nine cruises to Southeast Alaska) on both sail and power boats. 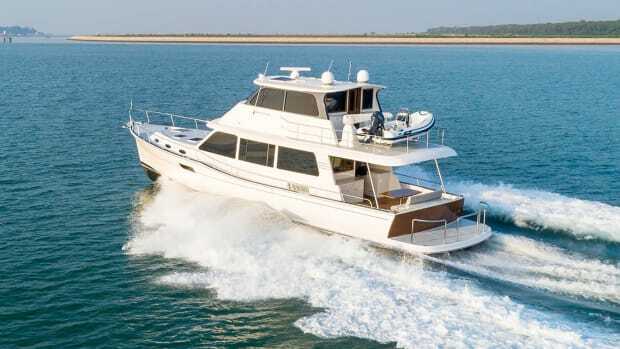 Today she singlehands her 45-foot trawler and cruises with friends as crew. Northern Lights, Inc. is a leading manufacturer of industry-best marine systems, including Northern Lights marine generator sets and Technicold air conditioning. Reliable, durable and simple to use, Northern Lights and Technicold products are designed for the unforgiving nature of the marine environment. Our systems are widely customizable to enhance the boating experience in pleasure craft, yacht and commercial marine applications. An ISO 9001 Certified company, Northern Lights is headquartered in Seattle, WA, USA, with a worldwide dealer network over 300 strong. More information is available at www.northern-lights.com. For over 50 years, the Northern Lights family of products has provided clean power, clear air and complete solutions. Technicold Marine Chillers and Air Handlers define the term “World Class”. Every unit uses the highest quality materials and components to ensure long life with minimal maintenance. Our engineers go the extra mile to ensure these units are compact, ultra-quiet, easy to install, and easy to maintain. Technicold Marine Air Conditioners and Refrigeration Systems are perfect for applications such as Yachts, Tug Boats, Fishing Boats, Ferries, and other pleasure craft and work boats. Need a boat loan? Talk to the Pros. 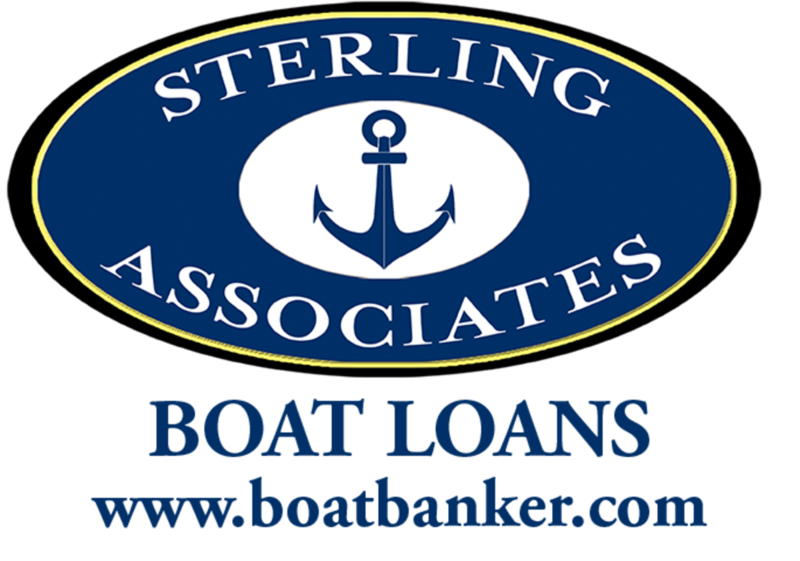 Sterling Associates offers boat and yacht loans at the lowest possible rates while providing the professional, personalized financial service you deserve. Whether you enjoy day trips or seasonal cruises up and down the coasts, Total Dollar has the right policy for you. For 25 years Total Dollar has built a first rate reputation, providing expertise that is second to none. We&apos;ll shop your boat with 12+ yacht insurers for the best possible deal!